Present state: The station has been demolished with a Waitrose store standing on the site of the west end of the platform and goods shed. An old peoples home called 'Station House' stands on the site of the station building. A service road to the Waitrose store follows the line of the platform to the rear. Notes: Abingdon had a single passenger platform with the main station building at right angles to it facing onto Stert Street. The building was brown limestone and red brick designed to blend in with other buildings in the locality. There was a substantial goods yard on the south of the station with five sidings serving a goods shed and cattle dock with a further siding into a stone built engine shed at the east end of the station. The three major buildings were not built to a typical design and were unique to Abingdon. coal siding was added together with a loading bank at the eastern end of the goods shed. In 1908 the station was badly damaged when a freight train ran into the back of an empty passenger train and the station was rebuilt the following year with another original building on the footprint of the earlier structure. 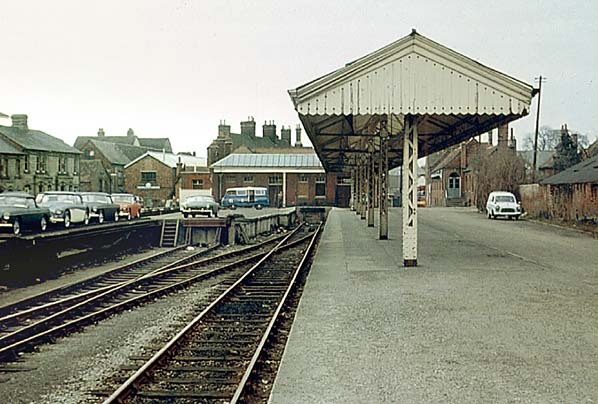 The trainshed roof was retained for a few years but was eventually replaced by a standard GWR canopy. 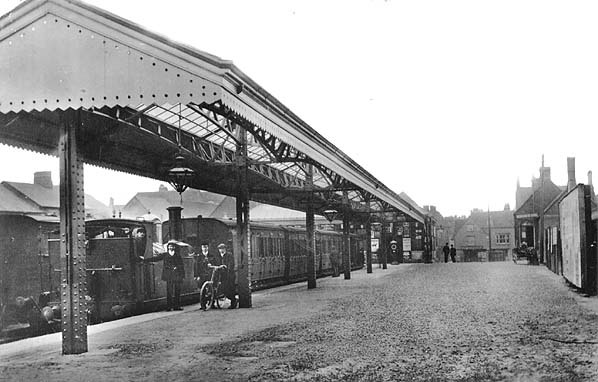 In 1911 the platform was extended up to the signalbox. The GWR also provided a brick stable block and although the GWR introduced motor lorries for goods deliveries in the 1930's horses were still used in the goods yard until 1950. 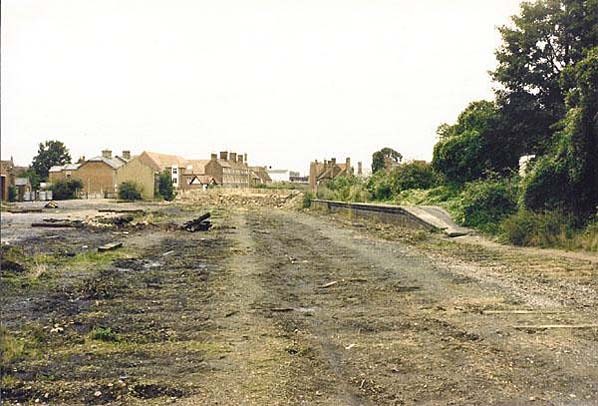 All the station buildings were demolished in 1971 leaving only the platform, track, goods office and the stable block, these survived until the late 1980's. When Brunel was planning his broad gauge line from London – Bristol the people of Abingdon hoped that the railway might be routed through the town but when the Bill received Royal Assent in 1835 it authorised a more southerly route passing through Steventon, four miles south of Abingdon. 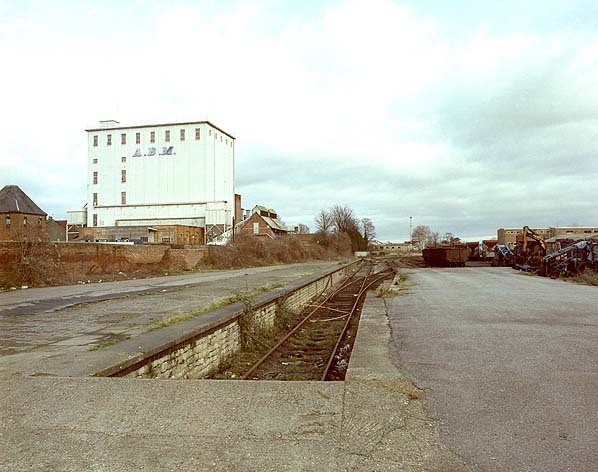 There was a further proposal to build a line from a junction with the Bristol line at Didcot to Oxford which, as proposed, would have passed "as near to Abingdon as possible", but this met with robust opposition from local landowners who forced the company to look for a more direct route with a branch into Abingdon but these plans were eventually scuppered by local objectors. alongside the existing line to complete a north - south route with mixed gauge trains arriving at Oxford from the north in 1872. Abingdon finally got its rail connection on 2nd June 1856 when a 1¾ mile broad gauge branch was built by the independent Abingdon Railway Company from a junction with the Oxford - Didcot line just north of the bridge over the River Thames at Nuneham where a junction station was provided. The service on the branch was provided by the Great Western who supplied locomotives, rolling stock and staff. Initially the line was prosperous with all bank loans paid off by 1870. 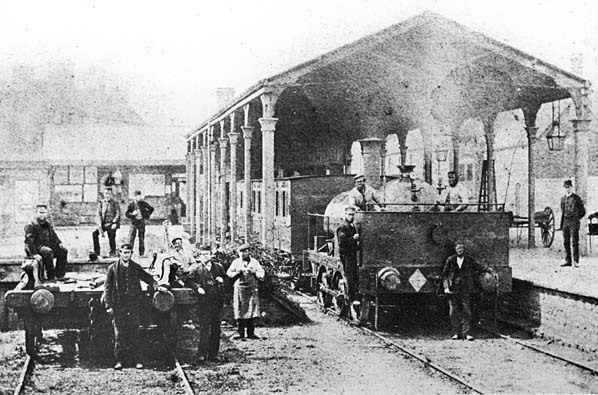 In November 1872, the branch was converted to standard gauge with the conversion being completed in one day; new sidings and goods accommodation were also provided at this time. The branch line was rerouted alongside the main line for ¾ of a mile to Radley where a new station was opened to replace Abingdon Junction. With the opening of the new standard gauge line coal could now reach Abingdon from the northern pits without the need to reload onto broad gauge wagons at Oxford. With a new cheap source of coal, Abingdon gasworks was resited alongside the station in 1886 with coal remaining the main income for the line for most of its life. nothing was done until 1908 when a freight train ran into an empty passenger train at Abingdon Station. Although there were no serious injuries the station was badly damaged and was completely rebuilt in 1909. During the GWR years the branch was well used, Abingdon was a busy market town while the surrounding area was intensively farmed and at its peak three goods trains a day served the railhead with parcels being carried on the regular passenger trains. The passenger services were generally steam hauled but before WW1 steam railmotors were tried out on the branch. At its peak in the 1930’s there were 18 passenger trains a day in each direction. There were some through trains; mainly 'specials', but the line primarily operated a shuttle service between Radley and Abingdon. During WW2 the airbase at RAF Abingdon ensured that the station remained well used by service personnel but after the war this stopped as staff numbers at the base and the Didcot Ordnance Depot were run down. In the late 1940’s the M.G. Car Company started using the railway to transport its sports cars, most of which were exported to the U.S.A. In 1956 the Royal train brought the Queen to Abingdon when she reopened the 17th century County Hall and although the station was spruced up for the occasion nothing could halt the decline with the signal box being relegated to a 'ground frame' when 'one engine in steam' was introduced onto the line. Despite the new freight revenue from MG cars, passenger numbers remained in decline so it came as no surprise when the branch was listed for closure in Dr Beeching's ‘Reshaping of British Railways’ in 1963 as it was uneconomical to keep it open. There was only a half-hearted local campaign to keep the service which was withdrawn from 9th September 1963 although the station remained open for freight traffic. and the line's future seemed assured until closure of the MG factory was announced in 1980. A proposed new coal depot half a mile east of Abingdon would have saved part of the branch from closure but this was never built and for the next four years the only traffic was the fortnightly coal train and the Royal Train which was occasionally parked there overnight. 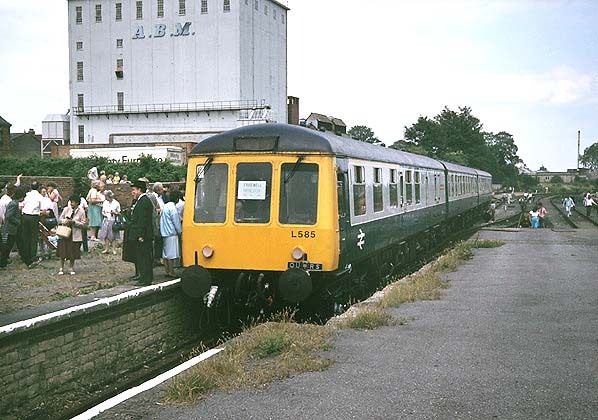 The line officially closed in June 1984 with a final passenger excursion visiting the branch on 30th June 1984. 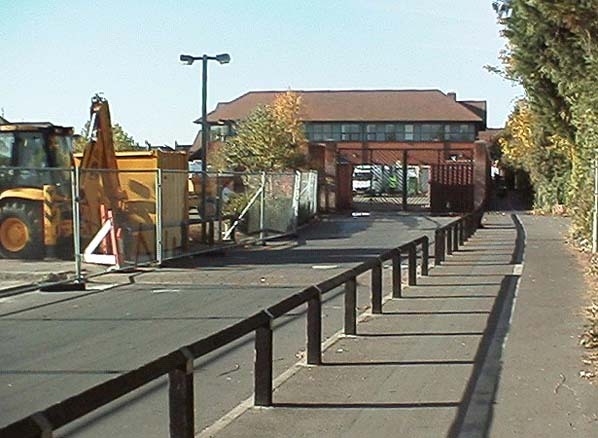 The track was finally lifted in the late 1980’s and the site was cleared ready for redevelopment. The site of the main station building at Abingdon is now a Waitrose store with a service road for Waitrose at the rear running east along the site of the platform. Much of the trackbed between Abingdon and Radley is now a cycleway. Looking east towards the site of the station building at Abingdon Station in June 2003.The platform would have followed the line of the railings.